What is the CHAMPSS program? What is included in the CHAMPSS program? Through the program, participants may receive a nutritious meal any time on weekdays during the restaurant’s service hours. The dietitian-approved menu allows seniors to select their choice of a complete meal and beverage. Each meal includes: the main entrée (select from menu), a drink (milk or orange juice), a jello or fruit cup, and tax. Tips are optional. How much does a CHAMPSS meal cost? The suggested donation is $4.00 per meal. The actual cost of each meal is approximately $10.00 to $11.00, so you are invited to be as generous as you can. NOTE: The City does not fund 100% of the CHAMPSS program costs, all donations received will assist Self-Help for the Elderly to subsidize some of the program operation costs. 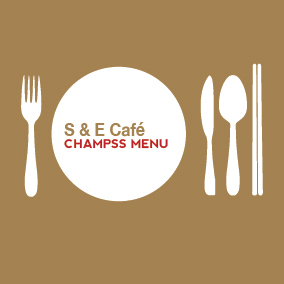 Just bring you Champss card, and enjoy your delicious meals at Champss participating restaurants. CHAMPSS has been so popular among seniors community since it was established in 2014. It provides unique opportunity for seniors to enjoy nutritious meals and to gather with friends and family in their neighborhood restaurants. Its popularity has been featured in numerous of media. DAAS has been working with many community-based organizations for years to offer congregate meals to seniors and adults with disabilities at many different locations throughout the city. Click here for list of congregate sites. The goal of the congregate program is to help seniors and adults with disabilities live independently by promoting better health through improved nutrition, through accessible and appropriate meal services, nutrition education and increased opportunities for participants to socialize. The traditional congregate meals sites provide diverse ethnic meals and offer many activities, but meal service times are usually limited to 1 to 1½ hour. With the CHAMPSS program, program participants have greater flexibility WHEN they want to eat and WHAT they want to eat from the CHAMPSS menu.